I had always known her name, been aware of titles such as The Ballad of the Sad Cafe. She was associated in my head with some vague idea of cool, that she herself was cool, that people who read her were cool. These were people who read John Steinbeck and probably listened to jazz, were young and revolutionary, but quietly and carefully so. I had no idea then, when for some reason that I cannot now recall, I picked up The Member of the Wedding, that I would be proven both right and wrong in my assumptions, and that I would become a devoted fan. Sometimes, one talks of a book that one loves. "Oh, that's one of my all time favourites..." we enthuse when it is mentioned in conversation, and feel pride and a certain ownership over said title. At other times, it is the author about whom we express adoration, and talk in terms of an entire oeuvre rather than a single book. Thus, I can talk for Britain on The Magus, though I would never call myself a huge fan of John Fowles, and on The Crow Road, though again not on Iain Banks. It is not, however, enough for me say that I love The Sea The Sea: it is Iris Murdoch whom I love. Muriel Spark, E.M Forster, and, as of last summer, Carson McCullers belong also to this latter category. Aged just twenty-three when her first novel, The Heart is a Lonely Hunter, was published, McCullers drew herself from the start in the role of the individualist, and the characters in her books do the same. They are magnificent examples of the downtrodden screaming for recognition; the fight for the right to express themselves is the crux of much of their motivation. This fight for expression may be fuelled by political reasons, as in the case of Blount in The Heart is a Lonely Hunter, or social, like Dr Copeland in the same book. It may be teenage desire to find one's calling, seen in all McCullers' young, female leads, who reflect her own androgyny (their very names, Frankie, Mick reflecting hers) and fierce need to find their own space. These characters - and I cannot think of a writer who creates more intriguing protagonists - inhabit the familiar world of Depression-era literature: small towns in the American South; heat and dust; silent night-time streets punctuated by drunks and brawls; drifters; racial segregation... it is easy to draw comparisons between both Mick, and more particularly Frankie, and Scout in To Kill a Mockingbird. But to do so would be simplistic. McCullers' novels are messier, dirtier, more layered. Her leads are not as pure as Jem and Scout, as their inquisitiveness takes them into areas Harper Lee never ventured near, such as sexuality. None of this explains why it is not simply one book about which I rave, but about McCullers' whole body of work. The reason is perhaps that her voice resonates so clearly in all her stories that when I read them, she begins to supercede authorship and becomes an entity within my life; it as though she were sitting by my bed telling me the tale. Her tone belies meaning - she explains herself through stylistic means, and once one is attuned to that style, a new level of understanding is reached. And so I find that in certain moods, I crave McCullers' writing, in the same way that one might be urged to see a particular friend, watch a specific type of film or have a certain food. I need simply to hear that voice again, to immerse myself in her world, and when that desire comes, I know no other writer will fulfil that need. I am the same with Murdoch - in another mood, only she will do, only her particular voice will suffice. I have a friend for whom Hemingway fills that role. "It happened that green and crazy summer when Frankie was twelve years old. This was the summer when for a long time she had not been a member. She belonged to no club and was a member of nothing in the world. Frankie had become an unjoined person who hung around in doorways, and she was afraid." Excellent post. I love the Magus, one of my all-time favourite books but I am also not a fan of all Fowles' work. I think you also described exactly what I feel about Murdoch. I have not read any books by Carson McCullers yet. That's a great opening paragraph. I will have to find this book! 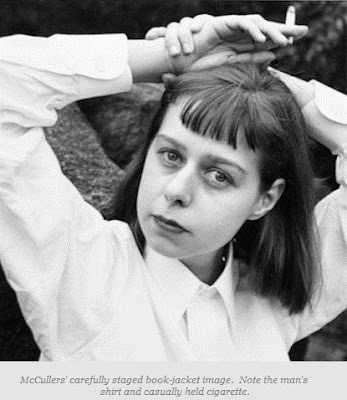 I've never read Carson McCullers and I can't believe she's escaped my radar before.